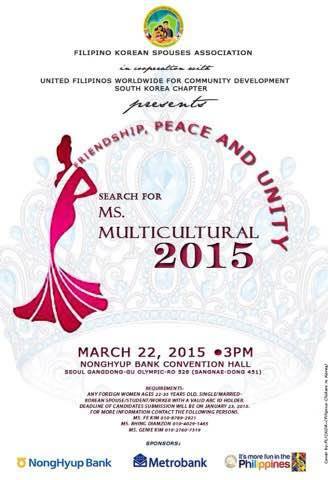 The FILIPINO KOREAN SPOUSES ASSOCIATION, a non-profit organization in South Korea that seeks to enhance the lives of Filipino-Korean families and recipient of the Philippine Presidential (Banaag) Award in December 2008, together with UNITED FILIPINOS WORLDWIDE FOR COMMUNITY DEVELOPMENT, is spearheading the “SEARCH FOR MULTICULTURAL 2015”, a friendly competition that aims to improve the camaraderie of foreigners living in South Korea. The pageant, with the theme “FRIENDSHIP, PEACE AND UNITY”, will be held on March 22 at Nongyup Convention Hall in Gangdong Gu, Olympic, Seoul City. Last year, only Filipinos were given the chance to join the pageant, but this year, ALL female foreign residents of South Korea from 22 to 35 years of age are encouraged to participate. This is a great opportunity for foreign women to make friends, showcase their talents and share a part of their culture. A foreign woman of any nationality from 22 to 35 years of age (marriage migrant, student, worker or multicultural child) who is either a Korean citizen or a valid visa holder (ARC/SOFA). Each contestant who will be chosen for special and minor awards will receive 50,000 KRW. *** The highest seller of raffle tickets for FKSA/UFWCD fund raising projects will be awarded Ms. Charity and is automatically one of the top five (5) finalists.